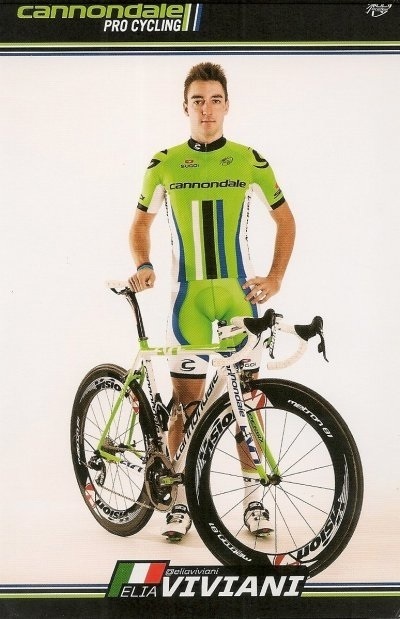 Cannondale's Italian rider Elia Viviani timed his sprint perfectly to win the first stage of the Tour of Britain. Mark Cavendish was boxed in and could not trouble Viviani, who beat his British rival's team-mate Alessandro Petacchi to take the 208-kilometre leg to Drumlanrig Castle. Cavendish finished 12th, with Team Sky's Sir Bradley Wiggins back in 37th. A crash behind the leading sprinters resulted in many of the frontrunners being given the same time for the day. The race rules state that no part of a group that enters the final three kilometres together will lose time because of a crash beyond that point. However, the time awarded for performances in the various sprints during the day means that Wiggins will begin Monday's 186.6km second stage between Carlisle and Kendal nine seconds off leader Vivani. A final messy sprint was a dramatic end to a cagey race that began in wet and windy conditions in the Scottish Borders town of Peebles. Team Sky's 2012 Tour de France champion Wiggins and Movistar's Colombian leader Nairo Quintana allowed a five-strong escape group to move clear in the opening stages. With Rapha Condor's British veteran Kristian House dictating the pace, the breakaway accumulated a five-minute advantage at one point, but, lacking any representatives from the high-profile teams and battling high winds, it never seemed likely to be enough. With 43km to go, Sojasun's French rider Anthony Delaplace leapt across the fast-closing gap with a daring solo burst and scooped up the final set of climbing and sprint points before his entertaining cameo came to an end. Britain's Alex Dowsett, who joined Movistar from Team Sky this season, made a similar, but shorter-lived, attempt to escape the rest with 12km to go, before his former team-mates chased him down to set up a tactical finish on the narrow, twisting uphill finish. Omega Pharma Quick-Step seemed well set with Cavendish tracking Pettachi, but their lead-out train de-coupled and Vivani took advantage with MTN's Gerard Ciolek third. Monday's 186.6km second stage takes place between Carlisle and Kendal.